There is no road from Panama to Colombia, so many cyclists choose to find sea transportation, probably out of a purist desire to avoid an airplane. It is nice to have the continuity of traveling on the earth, although not necessarily cheaper or better. It does turn out that while there are not regularly scheduled services to Cartagena, you can probably get there just fine. Trying to get there for free on a yacht from Colon is probably possible, but won't work for most people. 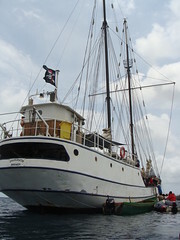 However, there are a number of boats that make the trip, charging US$275 to $350, and there are hostels that arrange the connections. So if you really want to sail, you can probably do it. Caveats: The trip is rough, and most people are seasick. Some boats do not provide food, so you need to provide your own. Some boats are disreputable or poorly run and you might get a scare or something worse. Some boats charge extra for the immigration paperwork in Colombia. Know what your payment covers. In Panama City, the hostel that seems to do all the arranging is Zuly´s. In Cartagena, the hostel doing the arranging is Casa Viena.